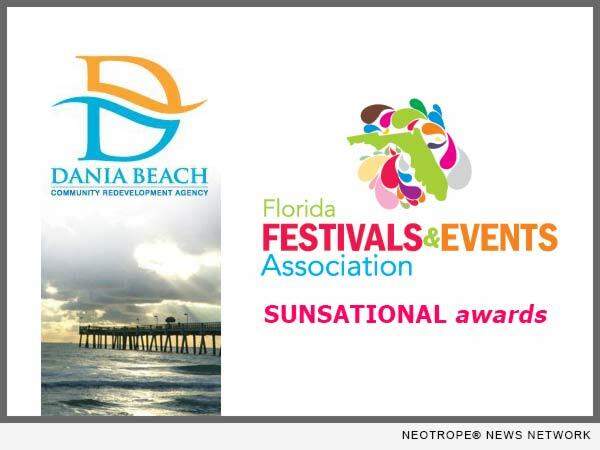 DANIA BEACH, Fla. /Florida Newswire/ — The Dania Beach CRA was a big winner this year at the 22nd Annual Florida Festivals & Events Association (FFEA) convention and trade show, taking home 11 SUNsational Awards. Dania Beach won the most awards in South Florida for its 4th annual Arts and Seafood Celebration and PATCH Urban Farm and Market. “We are beyond humbled to win these awards and to showcase all of the hard-work and dedication the CRA puts behind everything we do!” states Rachel Bach, DBCRA Executive Director. Nominations for awards were accepted in nine categories, including Printed Materials; Outdoor Advertisement; PR / Media Campaign; Photo; Promotional Item; T-shirt; Broadcast Media; Multimedia Marketing and Programming. Each category included three budget levels. A total of 130 events submitted their materials for consideration and they were judged by a blue ribbon panel of professionals. South Florida was well represented with FFEA Members in the area receiving 131 total awards, with the Dania Beach Redevelopment Agency (DBCRA) winning a total of 11 awards. The following is a list of South Florida winners — for a complete list of winners visit http://www.ffea.com/sunsational-awards. For more information on the DBCRA’s events, call 954-924-6801. For more information about FFEA, visit http://www.ffea.com/.